Even though we have a few more months until Halloween will arrive this year (although I'm sure it will be upon us before I know it), that doesn't mean that we are lacking in opportunities for wearing costumes around here. Considering how much fun my girls have in October, it's not a surprise that they enjoy finding times to dress up throughout the rest of the year as well. Trip to the grocery store? Perfect time to dress as a superhero. Going to a birthday party? It just makes sense to pull out your Cinderella gown. Time to get dressed for school? Logic says that the full firefighter costume would make sense, doesn't it? Recently, however, I managed to bring an entirely new smile to Little Sister B's face when I showed her the wide selection of costumes for a girl available (and affordable) from CostumeDiscounters.com. The dress-up possibilities are endless! Princesses, fairy tales, television, movies, Disney, animals... for an outgoing young lady such as Little Sister B, there really were more than enough sweet, sassy or spooky options that she would have clearly loved to have in her closet. However, there was no question that when it came to picking out one favorite, she had to go with one of the princesses that has forever held a special place in her heart, Ariel from The Little Mermaid. 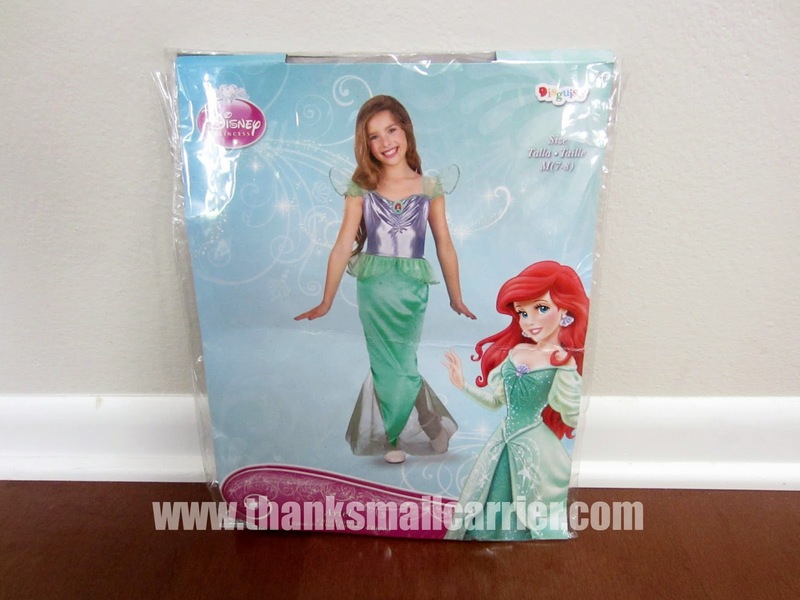 Available in small, medium and large (4-6, 7-8 and 10-12, respectively), this Ariel Little Mermaid Costume is a perfectly simple, yet perfectly shiny and eye-catching way to allow your little girl to dress like a mermaid. When this decorative and dainty costume arrived, there was no way that Little Sister B was going to wait even one more day before becoming an underwater princess. Right out of the bag, we unfolded this dress and found that the 100% polyester material was soft and smooth and that the addition of the sparkly nylon sleeves, ruffles and "fins" were just the right decorative touch. While the top portion of this dress is a little thin and would definitely need an extra layer for trick-or-treating here in the Midwest, I do appreciate that Costume Discounters made it overall very easy to wear. 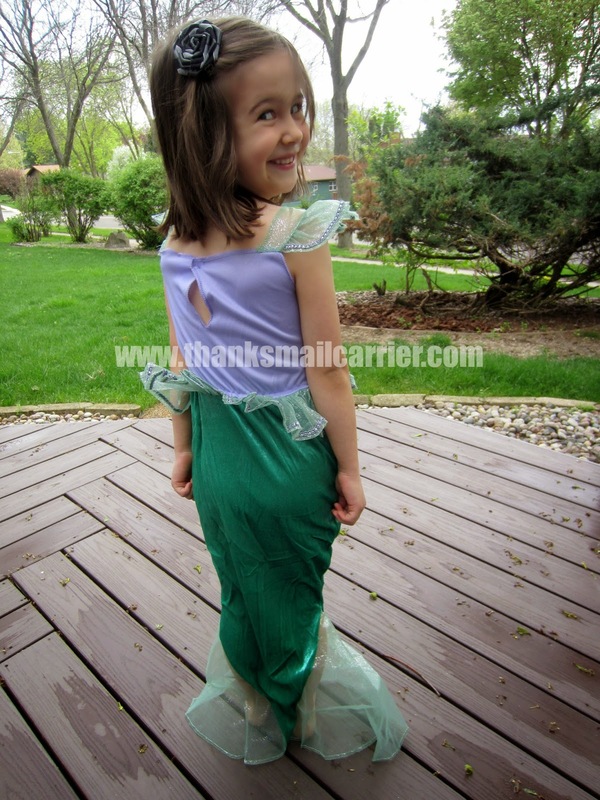 The bottom portion of the dress manages to capture the look of a mermaid's tail just right, yet the fabric is stretchy and spacious enough that the young wearer can still walk safely. All that is left to do is slip this on, shut the single Velcro closure on the upper back (no bothersome snaps or clasps!) and my little mermaid is ready to sparkle and shine while she sings, dances and more! It has been no surprise that Little Sister B has been thrilled with this Ariel Little Mermaid Costume since its arrival and I have no doubt that it will continue to make appearances at our house (as well as various other locations) for as long as possible. Good thing it can be hand washed, as it has been worn day after day already! 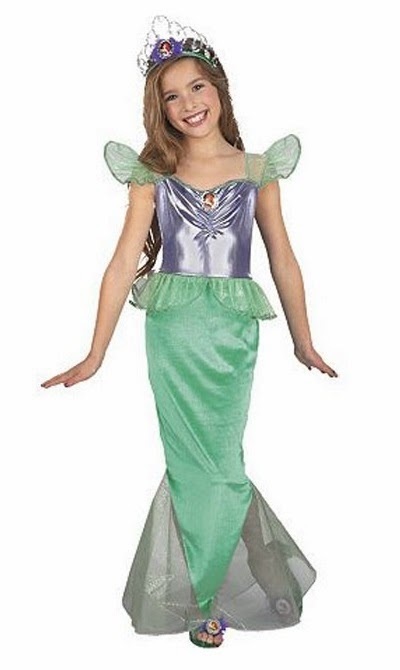 Retailing for an affordable $19.99, all that is left is to add some accessories (Costume Discounters has great ideas such as an Ariel Wig, tiara, wand and more) and you'll have a fully elegant, child-friendly costume your girl is sure to love. For more information about CostumeDiscounters.com, their fast shipping, their helpful customer service and their great costumes and accessories, visit their website and find them on Twitter and Facebook. Other than the Ariel costume that I was sent from Costume Discounters in order to facilitate my review, I was not compensated or enticed to do this post in any way. This review is solely my honest opinion of this product. 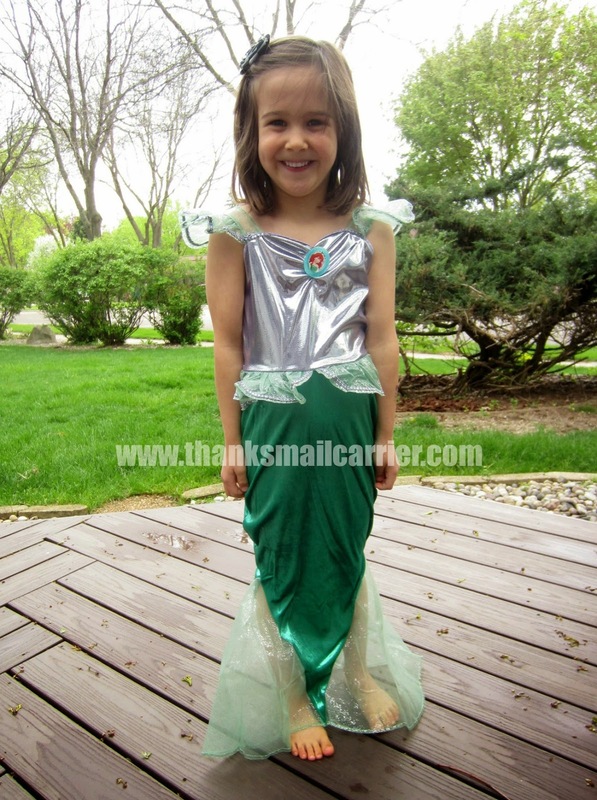 What an adorable costume, what little girl wouldn't want to be Ariel! When I first started reading this post, I was thinking how silly it is to buy special costumes for kids; we used to play "dress up" with cast-off clothes and things like that (and we liked it--LOL). But then I saw the picture of your little girl in her pretty outfit and now I totally get it. Cute, cute, cute, and so happy! We used to have a clothes trunk in the attic that we played dress up with. This is a cute Ariel. Yes, there are a few more months before Halloween hits us, but it's never too early to get your ducks in a row, so to speak. If you can get the kids set with their costumes then that's one less thing that you have to worry about. Thank you for sharing this review. This is such a cute costume. Like you said, October will be here before you know it. I'm excited to see which costumes my nieces and my nephew are going to wear this year. This would be a cute option for my oldest niece. I also really like the Wonder Woman one at the top of your post. Never a bad time to buy a new costume and expand the imagination. In fact, we looked at them online for about an hour today then we put on Hulk. What an adorable costume to get right now. 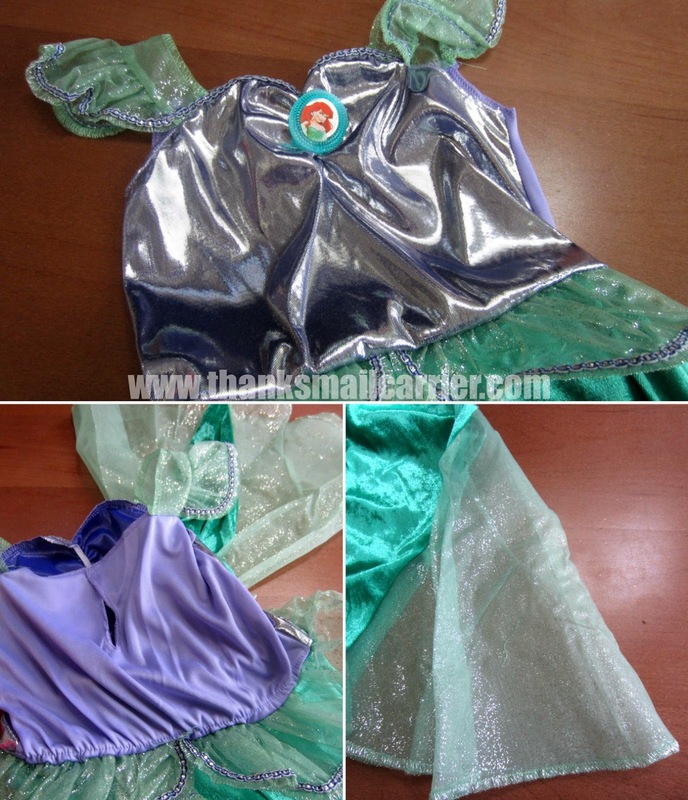 My niece would look so cute in this Ariel outfit for Halloween. I will have to get it for her! !